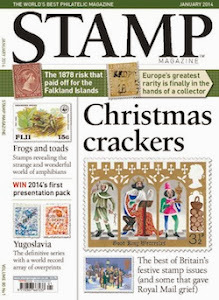 The May 2013 issue of Stamp Magazine holds more fascinating features. Last week I took up its theme of tin can mail, this week I'd like to direct your attention to the great feature by Jeff Dugdale on Greek mythology. Actually, he sort of beat me to it as I have had very vague plans to do something similar for ages! 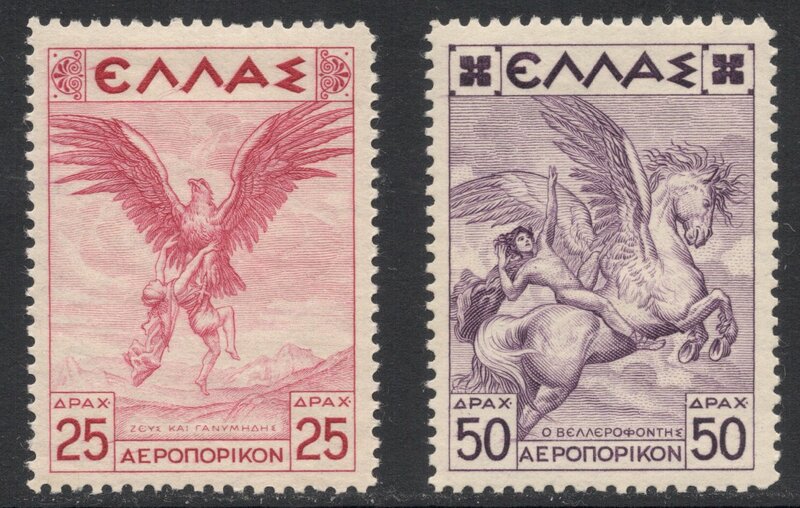 Now that I no longer have to, I'll just show part of the set which I was to have used as a basis for it: the 1935 Greek airmail set depicting various mythological scenes. It is a beautiful recess-printed set, with printing plates prepared by de La Rue, even though the stamps themselves were printed in Greece. I was therefore glad to see that Jeff used some of the stamps from that set in his story as well. 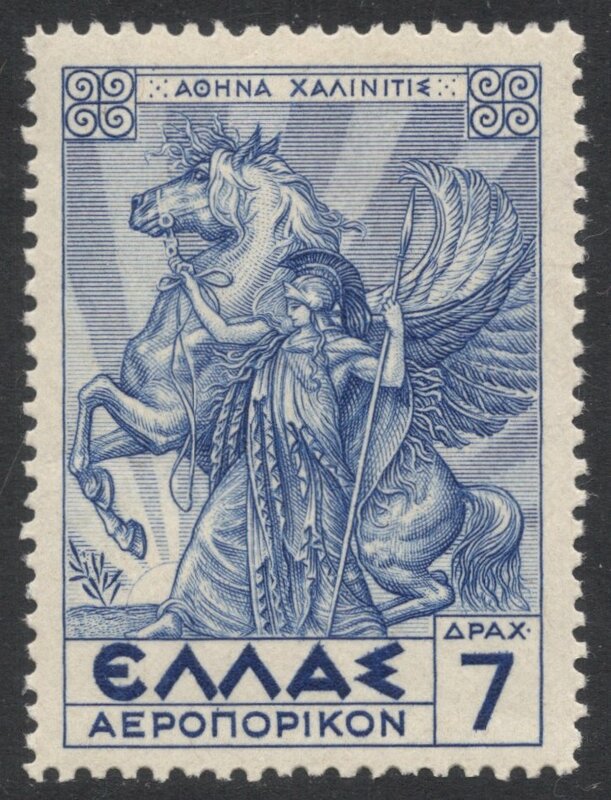 He showed the 25d value depicting Zeus, as an eagle, carrying off Ganymedes, and the 50d depicting Bellerophon on Pegasus. 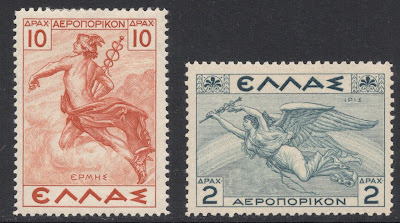 On some of the stamps of the 1935 set we find Greek gods which have been mentioned in Jeff's story. Most familiar to us stamp collectors will be Hermes, the messenger of the gods. 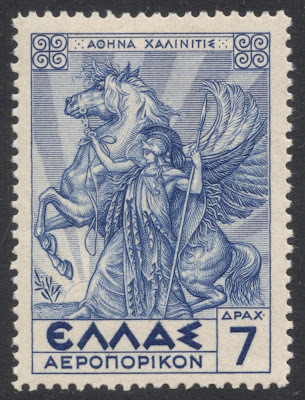 On the 10d value (which was originally printed in brown, but later reprinted in orange-red, as seen here) we find him with his familiar winged cap and winged sandals, holding his herald's staff in his hands. His female counterpart, Iris, may be found on the 2d value. 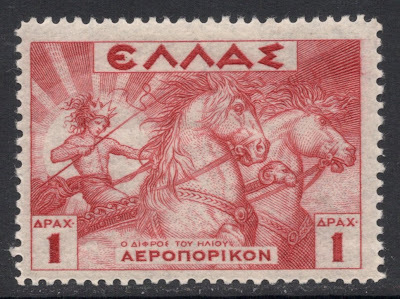 A rather stunning design is that of Helios, the Sun God, on the 1d value. Helios rides his sun chariot, drawn by solar steeds, through the sky every day. Helios does not really feature in Jeff's story, but in a way he is represented, by Apollo. Although original sources claimed Helios and Apollo to be separate gods, their stories have intertwined and they were later often considered to be one and the same. Back in the old days, when many things in the world were unexplained, myths were a way of trying to make sense of things, however wrong they later proved to be. One such myth relates to Helios' son Phaëton, who also wanted to ride the chariot. After endless nagging, the father finally gave in and let his son ride the chariot for one day only. Of course Phaëton could not control the horses. The chariot went out of control and plunged towards the earth, scorching everything in his path. That is why, so the story tells us, Africa is all desert and its population is black. 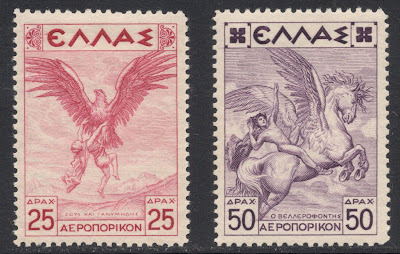 While restudying these stamps for this blog, I suddenly noticed that all the designs had to do with flight in one way or another. Makes sense of course, it being an airmail set! And so we have Pallas Athena on the 7d value. The lady herself is not really known for flying through the sky, but in some stories she is credited with taming the winged horse Pegasus, which we've already encountered on the 50d value. 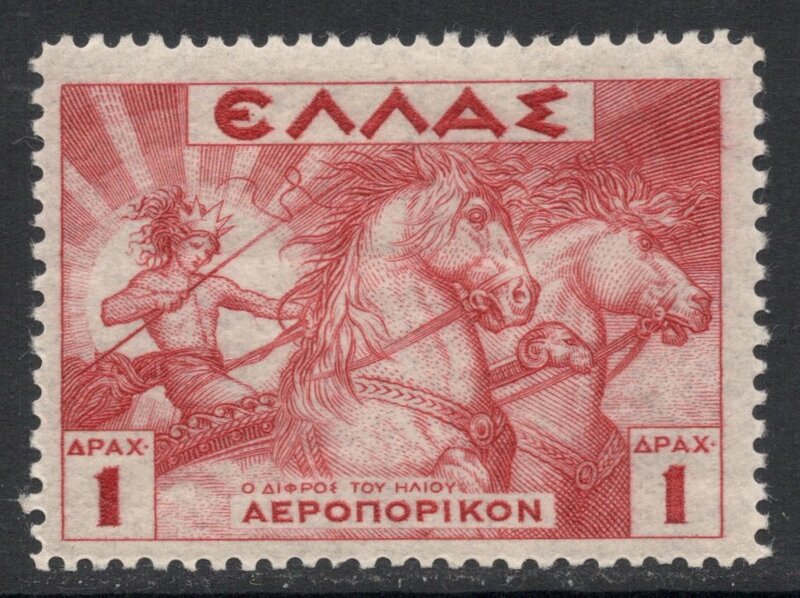 The horse is also included in the Athena design, neatly conforming to the flight theme. 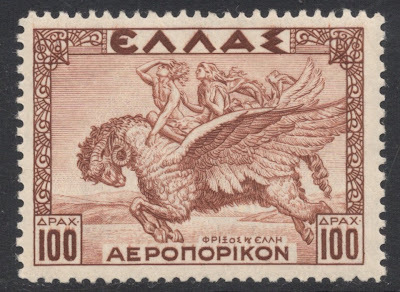 The top value of the set, the 100d, depicts two children on what seems to be a flying ram. They are the twins Phrixus and Helle. They were hated by their stepmother who plotted to have them killed. The children were rescued, though, by a flying ram with golden wool. Unfortunately, the girl Helle fell off mid-flight and dropped into the sea. That sea has since been known as Hellespont, in north-western Turkey, although it is now better known as the Dardanelles. 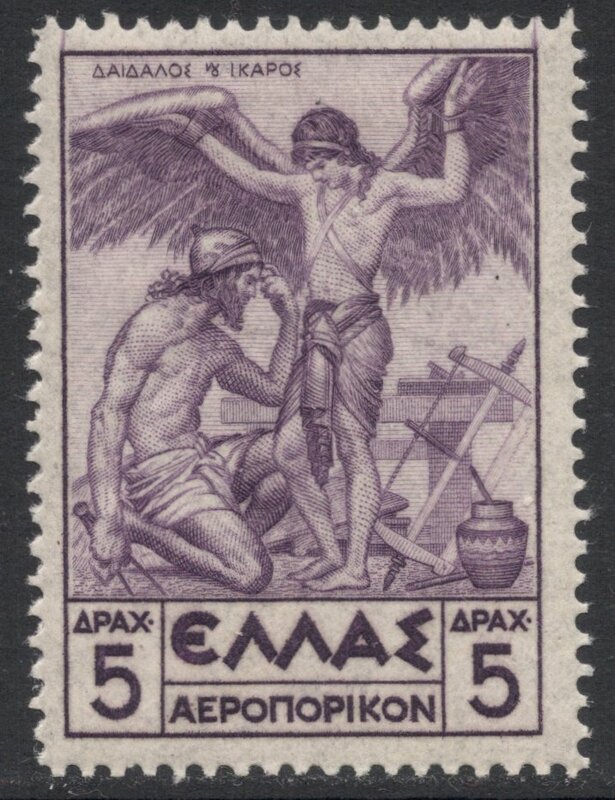 The most famous flight myth is of course that of Daedalus and his son Icarus, who may be found on the 5d stamp. It is rather sad, really, for it tells the tale of a father and son who were imprisoned and their only way of escape was to fly away. So, the father made wings of feathers and wax, for both himself and his son, warning his son not too fly too high or the sun might melt the wax. Unfortunately, the son, in his youthful brazenness, ignored the warning, flew up high in the sky and what the father had predicted happened: the sun melt the wax, and the son plunged into the sea and drowned. The grief-stricken father named the island nearby Icaria, in memory of his son.